While digging out a new basement near Los Angeles, homeowners accidentally unearth a 3,000-year-old Phoenician altar. A treasure-hunter in Ohio finds more than he expected, when his metal detector locates an Eastern Mediterranean pendant from 1000 bc. Two caches of coins minted in Imperial Rome surface along the Ohio River. A Smithsonian Institution archaeologist excavating a Native American burial mound in Tennessee removes a stone emblazoned with a second century Hebrew inscription. These are just a few of the dramatic finds described in The Lost Worlds of Ancient America. They confirm that our continent was visited and influenced by visitors from Europe and the Near East hundreds, even thousands of years before its "official" discovery in 1492. 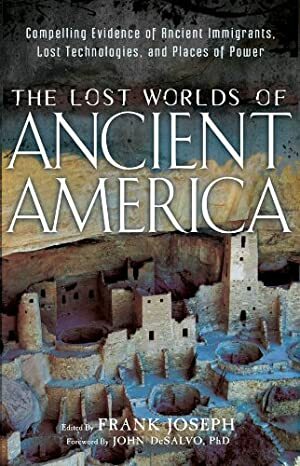 As such, this startling, fresh proof of their powerful impact on the pre-Columbian New World offers us a different view of American origins that threatens to re-write mainstream textbooks. • Wayne May, founder and publisher of Ancient American magazine. Log In to track Frank Joseph on eReaderIQ. to be notified each time the price drops on any book by Frank Joseph. to stop tracking Frank Joseph. Log In to track John DeSalvo on eReaderIQ. to be notified each time the price drops on any book by John DeSalvo. to stop tracking John DeSalvo. We started tracking this book on August 18, 2015. This book was $12.47 when we started tracking it. The price of this book has changed 24 times in the past 1,342 days. The current price of this book is $13.03 last checked 3 months ago. The highest price to date was $17.09 last reached on June 21, 2017. This book has been $17.09 one time since we started tracking it. We last verified the price of this book about 3 months ago. At that time, the price was $13.03. This price is subject to change. The price displayed on the Amazon.ca website at the time of purchase is the price you will pay for this book. Please confirm the price before making any purchases.